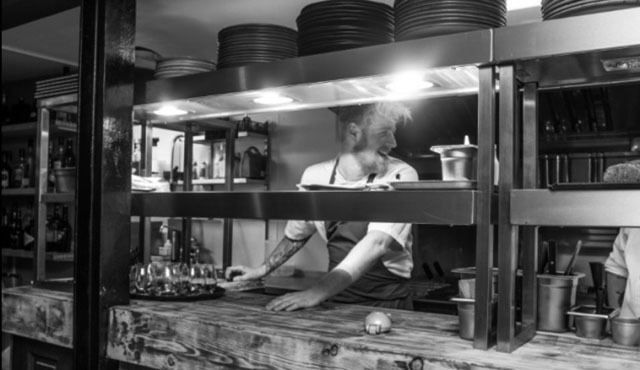 I’m going to launch straight in to tell you about one of the best meals we’ve enjoyed in a long while, at Tom Mackins’ new Chapter 1 Restaurant in the heart of Newquay. 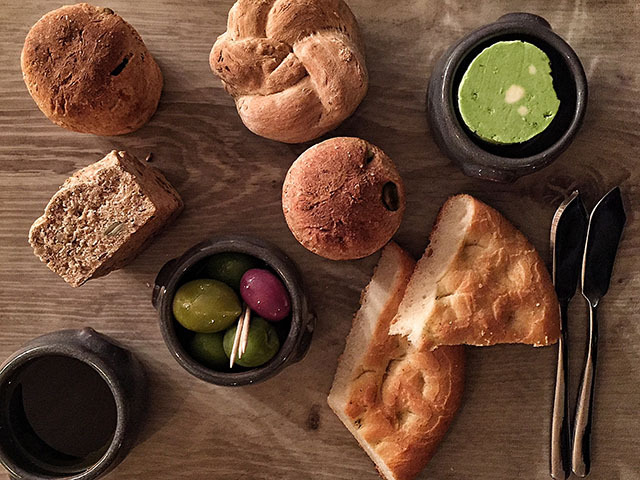 We kicked off with a selection of fresh bread, still warm from the oven, juicy olives, and a pat of chilled wild garlic butter. The focaccia crust was crisp and salty, the inside soft and oily. The little knot of brown bread was moreish, and we enjoyed it slathered with the vivid green butter. My favourite was the pistachio bread, packed full of nuts, and just heavenly when dipped into the olive oil and sticky, sweet balsamic. It took all my will power not to eat it all immediately. Next we were presented with a stunning looking dish: cod tortelloni with wild garlic. 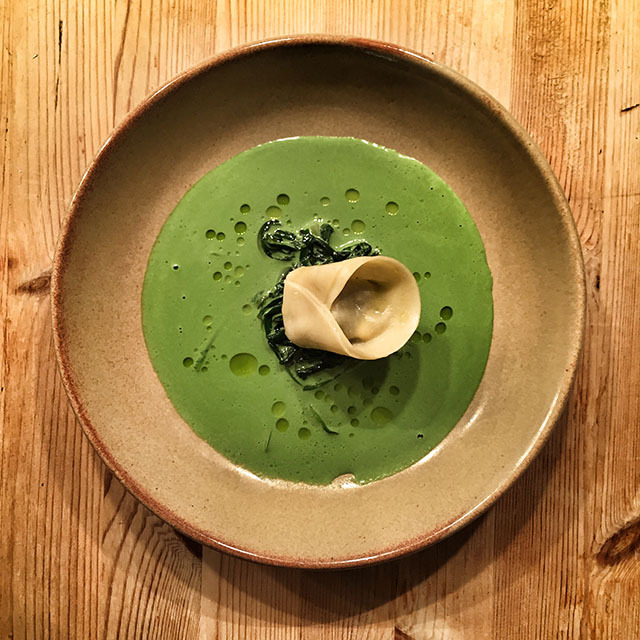 The single, large tortelloni – perfectly cooked and stuffed with cod – sat on a bed of wild garlic leaves, which tasted more like pak choi, the harshness of the garlic having been removed by blanching. This was surrounded by a creamy, salty, gorgeously green wild garlic soup, dotted with olive and parsley oils. We wiped our bowls clean with the remaining bread, not wanting to miss a drop. The following dish was entitled “Seafood Black and White”. 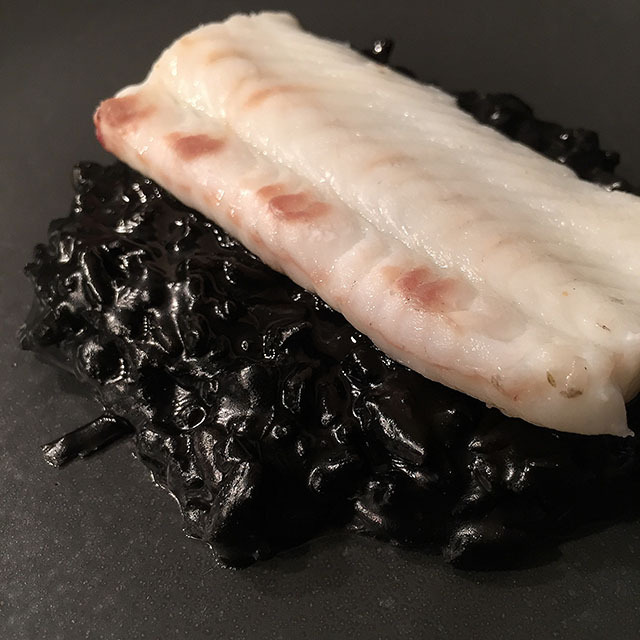 The squid ink risotto was glossy, black and unctuous, with a real depth of flavour – lemon and Parmesan as well as the squid ink, and perfectly al dente rice. The fillet of Dover sole was really meaty, with a great texture. The plate may have looked simple, but there was more going on here than you’d think. Plus we ended up with black teeth, which is always amusing. 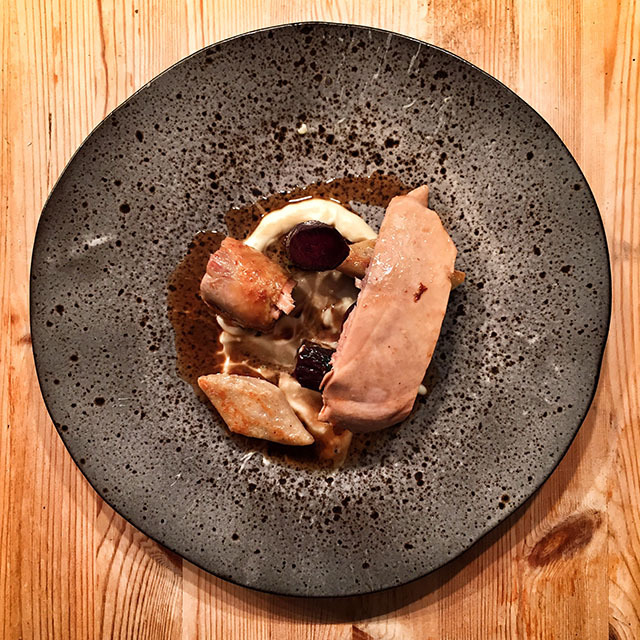 Our fourth course was guinea fowl – one of my favourite meats, and rarely found on menus – poached in beef stock. The roll of succulent leg meat and slice of tender breast were served on cauliflower purée, with sticky, sautéed gnocchi and sweet and earthy roasted beets. The flavours were amazing. It was at this point in the meal that I realised that Tom’s cooking is not dissimilar to Paul Ainsworth’s. The deceptive simplicity and flavour combinations really reminded me of food I’ve enjoyed at Number 6. I mentioned this to Tom and apparently I was not the first person to make this comparison. Let’s hope it is a sign of exciting things to come. At this point in a tasting menu I would expect a shot of sorbet, or something small, but Tom had pulled out all the stops and we were given a pork dish. A succulent chunk of belly pork and perfectly pink slice of tenderloin were accompanied by mashed carrots and swede, with sticky prunes and roasted shallots. 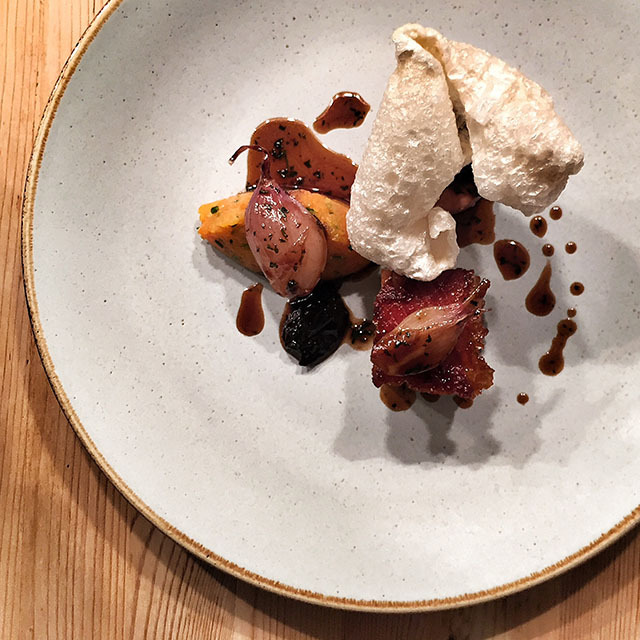 The star of the dish, however, was a huge quaver-esque piece of pufffed crackling, with the texture of popcorn and prawn crackers, and the flavour of salty pork. The dessert was a work of art, and tasted as spectacular as it looked. Tom described it as his take on a Black Forest Gateau. The rectangular slab of dark chocolate and brown butter terrine was thick, rich and salty. The smooth and creamy chocolate ganache was a little lighter. 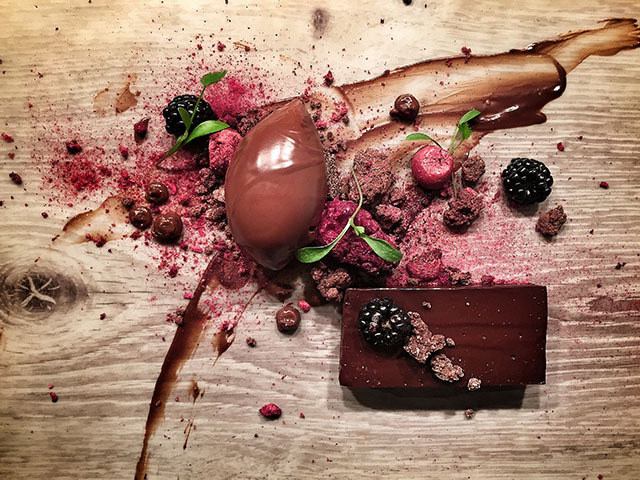 Dried raspberries, raspberry powder, fresh blackberries and dried cherries – which had the texture of mini meringues – were artfully scattered across the plate. Micro-coriander added to the taste sensation. There were crunchy bits, fruity bits, chocolatey bits and saucy bits. Tom was only 25 when he opened Chapter 1 eight weeks ago. 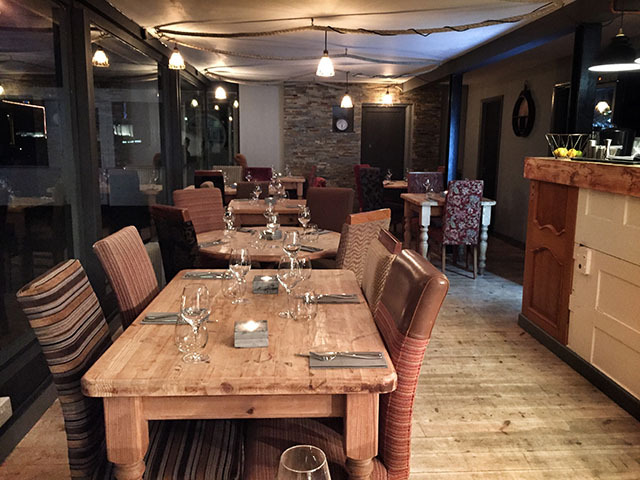 The restaurant is unassuming and hidden away, just off Cliff Road in the centre of Newquay. I predict that when word gets out, Chapter 1 is going to be very popular. Book a table now, while you can. We were guests at the restaurant for the evening; thank you very much to Tom for his hospitality. Follow Tom on Twitter or Instagram for more pictures of his food. The six-course tasting menu is priced at £35 per person. On the à la carte menu, starters are £6.50-£7.50 / main courses £14.50-£21 / desserts £6.50 / cheese £11.00. The wine list is very well selected and reasonably priced; we enjoyed a delicious, crisp pinot gris. Several wines are available by the glass, and there is a good selection of reds, whites and rosés at £18 per bottle, and prosecco for £22.